Singer Koji Moriyama grew up in a musical family with a father who was an opera singer. He learned tap dancing, classic ballet, piano and percussion instruments. He began his professional career as a tap dancer but studied singing on his own and started singing in jazz clubs. After paying dues for more than a decade in the entertainment business, he finally had an opportunity to record his first album, Night And Day. Three Blind Mice producer Takeshi Fujii paired him with the best possible band to back him up; a trio led by pianist Tsuyoshi Yamamoto who was a bright rising star in the Japanese jazz scene. As a result, this swinging album became a great launching pad for Moriyama, showcasing his wonderful vocal abilities which included impeccable timing and urban sophistication. 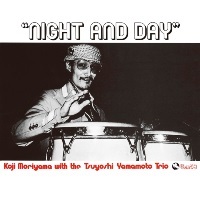 Moriyama played congas on three of the seven tracks. Produced by Takeshi Fujii. Recorded at Aoi Studio in Tokyo on December 16, 1975. Blu-spec CD is compatible with all regular CD players. Paper sleeve special limited edition.